Introducing the Mystic Venetian Masquerade Mask – in black. For the uninhibited looking for classic glamour, the Mystic is a gothic take on a traditional Venetian theme. It mixes black crystals with spike detailing set on a base of black satin to create a dramatic half-face mask. The Mystic calls for an authentic masquerade costume to complete the look for your special occasion masked ball. It fits comfortably around your head with adjustable satin ties to keep the mask in place all night long. Typical of the all the luxury Venetian masks in our collection, the Mystic is handmade using age old skills. 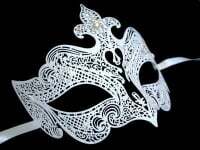 Simply Masquerade customers come to us knowing they will be purchasing a genuine Venetian mask. They prefer its quality and comfort, which no mass produced or machine made version can imitate. They want an original not a copy. Why not let The Mystic bring a little Venetian Carnival atmosphere to your masquerade party? 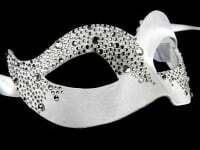 Order your luxury masquerade mask now and get it delivered free within the UK.